Iain Henderson has suffered a finger injury that will dent Ireland’s resources at lock for the start of their Six Nations defence. 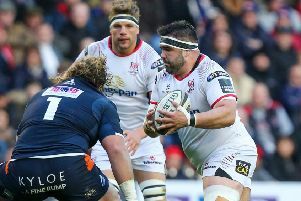 Ulster lock Henderson’s new blow comes on the same day Munster second row Tadhg Beirne was ruled out of Ireland’s first two Six Nations encounters due to a knee problem. Ireland still have James Ryan, Devin Toner, Ultan Dillane and Quinn Roux in the ranks, but both Henderson and Beirne would have been pressing hard for action. Henderson had only just returned from a five-week lay-off due to a thumb problem for Saturday’s 14-13 Champions Cup win at Leicester, and picked up a fresh injury in that Welford Road victory. “Iain Henderson suffered a finger injury that is likely to keep him sidelined for several weeks,” Ulster Rugby confirmed in a statement on Monday afternoon. British and Irish Lions lock Henderson’s absence will be a clear blow to head coach Joe Schmidt, especially off the back of in-form Munster second row Beirne’s injury too. Ireland confirmed on Monday morning that Beirne will miss the opening Six Nations matches, against England and Scotland, owing to a knee complaint. Ireland called up Connacht’s Roux as cover, ahead of their opening Six Nations clash against England in Dublin on February 2. Leinster’s Adam Byrne has been added to the Irish contingent’s training camp in Portugal, with Rob Kearney and Jack McGrath remaining with the province this week for extra game time.